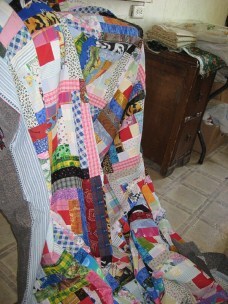 I think the best way to honor my grandmother is with a memory quilt so I care remember her and share her with others. My family has recently had the tragic event of our grandmother passing on. We all do know she is now in a better place, the tragedy of it is how much my family will miss her presence and wisdom in our lives. She was the leader of the family and every one respected her. It was kind of funny, watching as a small child, how her big burly sons take orders from the small quiet woman without hesitation. That was how much respect she had garnered. My grandmother had always made it a point to instill in all of her family members the true importance of family. It was this unity and strength she would repeatedly talk about when telling the stories of her childhood growing up in a pioneer family. She would emphasize that without this strength, the family would have never survived in the days before the land my family settled on became a state in the union. There were very few pictures back in that time, but the stories were very vivid and all of the grandchildren and great grandchildren could envision them as if they were on television. Yes, she was not only the leader, but the historian of the family. She could bring to life the days of horse and buggies, and kerosene lanterns were all that was available. She even recollected her experiences with the native people of the land, which was nothing like the versions from Hollywood. These stories and family gatherings would occur on the third Sunday of every month. No matter how old she was getting, she always helped in preparing the family meal until she passed away at the age of 102. To help keep her memories alive along with her legacy, many of us in the family collected what we could that reminded us of her, along with the pictures of her. 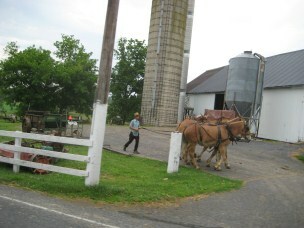 What was lucky for us was that we found the Amish quilters. They have a process that can take the old black and white photos of my grandmother and transpose them onto cloth without damaging the original picture. This made it possible to bring the stories my grandmother used to tell us about her life. As part of the framework around some of the pictures, there are pieces of cloth from the wardrobe of my grandmother. For the younger children of the future, these cloths will not have as much sentimental meaning until they are told what it really is. For me, it brings back a flood of memories that bring me joy and serenity as if my grandmother is still with me. Today, I recount the stories of my grandmother with the memory quilt the Amish Quilter has created for my family. This allows for me to pass on the heritage of my family and the memory of my grandmother in the best possible manner. Not only can the new generations benefit from the stories, but they can feel the warmth and comfort from the quilt that my grandmother gave me when I was near her.